What is another word for disputed? Disputing, questionable, Impugned, litigious, dubious, divisive, conflicting, troubled, disagreement, disturbed, disordered, problematic, objectionable, restive, doubtful, uncontroversial, sticking, suspicious, mysterious, contradictory, polemical, challenging, outstanding. 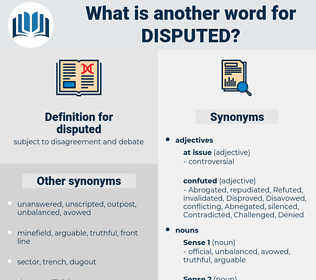 Disagreed, Questioned, Protested, dismissed, Refuted, Differed, Discussed, doubted, Deliberated, Contended, Challenged, Refused, Argued, Appealed, agreed, rejected, rejects, Responded, Denied, Declined, Replied, Objected, objects, Answered, Took, Did. Debated, Disagreed, unquestioned, Questioned, upset, Refuted, Indicated, Litigated, Discussed, Eradicated, uncontested, reconsidered, doubted, Deliberated, Contended, established, put, implicated, Subjected, jeopardised, Compromised, Criticised, criticized, Arisen, Resisted, unopposed, challenge, Excluded, Challenged, Refused, Argued, Jeopardized, Rebutted, Appealed, countered, Prevented, tested, negated, exploded, undermined, Decried, rejected, Responded, withheld, Vetoed, Attacked, Denied, Declined, Queried, Combated, combatted, spoken, Tackled, Replied, Adduced, Objected, Compiled, eroded, handled, endangered, raised, played, paid, prepared, financed, vexed, Brought, threatened, Answered, Dealt, placed, controlled, Talked, covered, Met, Impugned. Nor were these matters only disputed in the schools, but, as is usually the case, were carried from the schools to the people. Certainly, my lord; but suppose - The will is disputed? dissipate, diaspididae, disbud, decapod, despite, ditch spade, dispute, dissipated, day shift, dish-shaped, despot, duck pate, dog bite, dog food, djibouti, decapitate, disk-shaped, decapitated, dash-pot, decapoda, dogsbody, disc-shaped, dasypodidae.